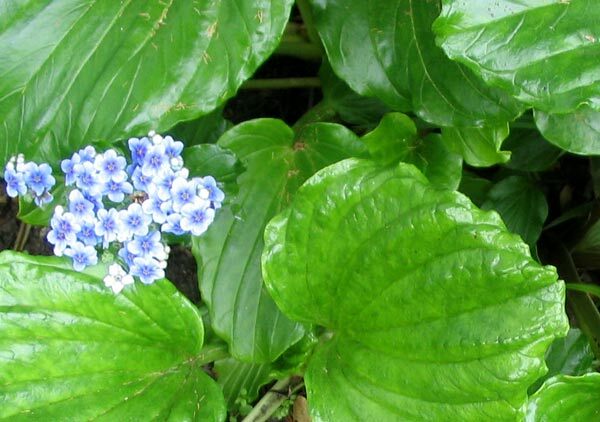 Chatham Island Forget-me-nots have large shiny leaves, ribbed and shaped rather like some hostas. They are evergreen, and the flowers in spring are sky blue and white. In my garden they get quite a few spring blasts from the nor-west wind, and the flower stems can get blown down. I've seen Chatham Island Forget-me-nots grow to be waist high with leaves the size of dinner plates - mine are nowhere near that yet. 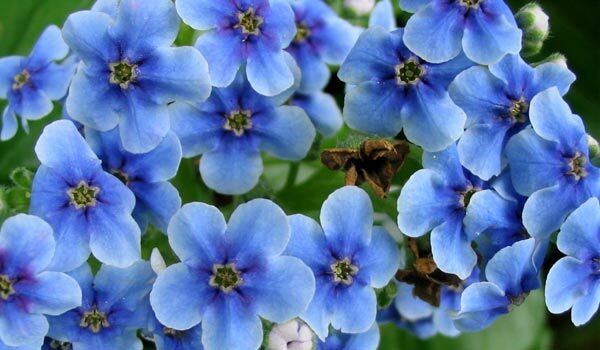 Different garden writers claim that Chatham Island Forget-me-nots like different conditions of sun and moisture. Recently I planted some more Chatham Island Forget-me-nots by the Sleep-out fence, and behind the woodshed. These spots should be more sheltered, moist enough, and sensibly shaded from the summer's hot sun. I'm hoping for fence-high plants next spring, and more chance to enjoy the blue flowers. The Chatham Islands (if you're wondering) are windswept and cold, somewhere in the southern ocean below New Zealand.